Knoco stories: Why some knowledge is also information, also vice versa, and what to do about it. Why some knowledge is also information, also vice versa, and what to do about it. Not all knowledge is information, not all infomation is knowledge. However some knowledge exists also as information, and therefore needs to be managed by both disciplines in parallel. This blog post is about the knowledge continuum, the relationship between knowledge and information, and how information management and knowledge management both handle the overlap between the two. This is still a thorny topic, and there are still organisations that think information management and knowledge management are essentially the same thing. But they aren't, and here's why. Let us assume that we are talking about knowledge in the sense that it refers to human ability, "know-how", the ability to make decisions and take actions. Immediately we run into the deficiencies of the English language, because in English we also tend to use the word Knowledge for the accumulation of facts and information - "know-what" in other words. Where in other languages these two concepts - know-how and know-what - have two different names (Savoir and Connaitre, Kennen and Vissen etc). But if we assume that we are talking about know-how, then this comes in a continuum, as shown in the figure above, and as described below. This knowledge then, in conversation, moves to the next stage of the continuum and becomes knowledge you have expressed but not recorded. This is explicit uncodified knowledge - spread through conversation, and open to being recorded. Finally there is knowledge you have recorded - explicit codified knowledge in the form of documents or recordings which contain know-how, and which can guide or advise others towards action. Here are your recipes, your tips and hints, your guidance notes, training material, best practices, standard operating procedures and checklists. As knowledge moves from the left of the continuum to the right, it loses richness and context, but gains in both manageability and robustness. By robustness I mean that much of the deep tacit knowledge may be a combination of real knowledge, options, biases and falsehoods (see here for a discussion of tacit knowledge and cognitive bias) and it is only through conversation and synthesis that these opinions are tested and become validated as knowledge. Various people draw the boundary between knowledge and information at different places on this continuum. Some draw it between stages 2 and 3, and claim that as soon as something is spoken it has become information. Others draw it between 3 and 4, claiming it has become information once it is codified. I would prefer to say that at stage 4, it is both information and knowledge. It is information which conveys knowledge in a written form, just as in stage 3 it is conversation which conveys knowledge, or knowledge in a spoken form. Information and Knowledge are not exclusive alternatives in some sort of Western Dualism, and something in our stage 4 above can be both information and knowledge. However there is one more item on our continuum. The codified explicit knowledge, which is held in the form of documents, finds itself rubbing shoulders with other documents - the documents which are not codified knowledge at all. By "not codified knowledge" I mean they do not address know-how and do not transfer knowledge of what to do or how to do things. An invoice, for example, allows you to know what price something was invoiced for, but it does not help you know how to become a better invoice clerk. A record of a meeting allows you to know what was discussed in a negotiation, but not how to be a better negotiator. These are documents, but do not carry knowledge. I have drawn the boundary between codified knowledge and "not knowledge" documents above as a hard boundary, but there may be some overlap between then - there may be documents that contain SOME knowledge, such as project reports with a "lessons learned" section, for example. 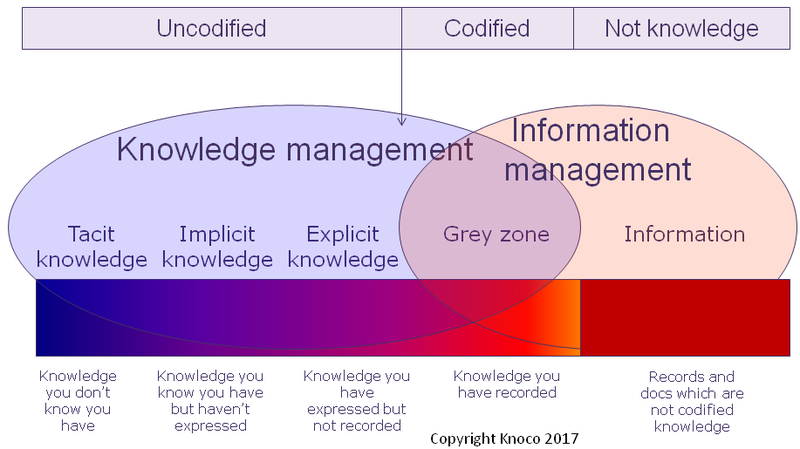 The grey zone, and the relationship between information management and knowledge management. We can see that there is a class of knowledge which is arguably both knowledge and information - class 4 above. This is the class that causes much of the confusion, with people assuming that because this knowledge is carried as documented content, then management of content equates to management of knowledge. However I would argue that class 4, being both information and knowledge, needs to be addressed by both disciplines. Codified knowledge, because it is in the form of information, is managed as information. It needs to comply with the IM requirements and needs to be categorised with the correct metadata using the correct taxonomy or ontology, and needs to follow the rules of information architecture and information lifecycle. Because it contains knowledge, it needs to comply with knowledge management, and the knowledge which the document contains needs to be valid, up-to-date, and structured in such a way as to be maximally useful to the reader. Knowledge Management addresses the content of the document, Information Management addresses the container - the document itself. Both the document and its contents are managed, but separately by the two separate disciplines. Knowledge Management and Information Management are two separate but complementary disciplines. Knowledge Management focuses on Knowledge, with the aim of developing and deploying collective know-how for business improvement. Information Management focuses on information, with the aim of getting the right information to the right people at the right time. Where knowledge is carried in the form of information, as codified knowledge within documents, then to these documents both disciplines are applicable. Information management is concerned with management of the document itself, knowledge management with the contents of the document.